Most managers would consider management far too complicated to script. But the five key components of management—planning, staffing, organizing, directing, and controlling—are practiced just as often in testing. So, let's see some of those management scripts. 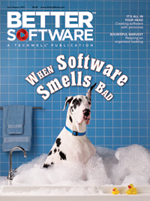 We all want to satisfy our users, but tailoring software to customers is easier said than done. Personas—a method to synthesize your primary users into abstract entities—facilitates understanding of goals and experiences. Scaling Agile to the enterprise can be challenging once you start looking at the Program and Portfolio level. How do you design an effective coordination system that encourages collaboration, communication, transparency and is flexible, easy to implement and rapidly evolvable? We will explore key aspects of creating a simple but effective agile-ready coordination system for managing such initiatives, based upon the authors' observations and experiences across widely differing companies.